The program PERMOL [1,2] which is part of the software package AUREMOL was developed to extract information about the conformation of a known protein in the form of restraints – specifically distances between atoms, dihedral angles and H-bonds - and then transfer this information to an unknown protein. 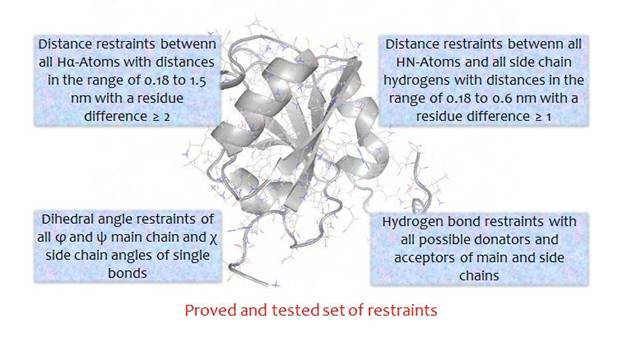 These restraints can be used for molecular dynamics as restrictions of the configuration space. 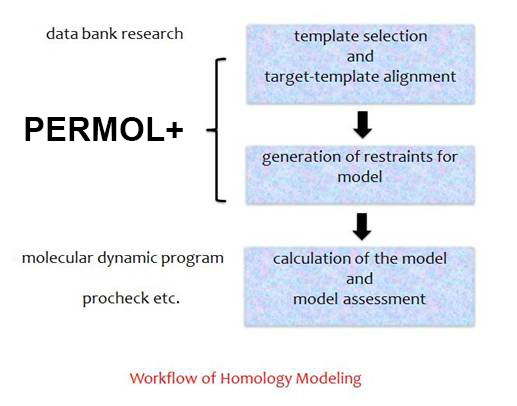 PERMOL was originally developed for homology modeling, which is based on the observation that two proteins share the same folding pattern even if they match in only 20 % of their sequence. This technique implicates three steps: First alignment of the unknown protein to one or more models, then the generation of the restraints – here the user has a lot of possibilities e.g. the selection of the atom types or the upper und the lower limit of the distance between the atoms, which should be considered at generation, or the selection of only parts of the sequence - and finally calculation of the new structure with the molecular dynamic program CNS. How to create restraints with PERMOL+? 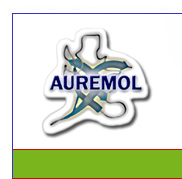 Use AUREMOL or download the standalone version of PERMOL+! Start it! Feed target sequence(s) of the protein(s) you will get the model: One-letter-code or an AUREMOL sequence file or the possiblity to extract it from a PDB file. Prepare the PDB files with your homologous proteins from which the informations will be extracted: Add hydrogens (if you will use XRAY-structures) and use IUPAC names for the atoms! Check the stereochemical nomination, too, because if there are mistakes you get structures with a lot of violations und big terms of energy! By the generation of restraints you choose between the standard set of restraints (show picture) or a user defined one! Choose a path for output! After you have clicked the OK-Button the alignment will be shown. This alignment can be edited, but the sequences cant't variated at all: You can shift the gaps (-). Be careful that at the end of your editing the sequences must have the same length: The signs + at the beginning and the end of the sequences must align. In addition you have the option to exclude parts of the sequences from information generation. Then the restraints will be generated.  Because of the big number of generated restraints (much more than by experimental data analysis) you have to adapt the possible parameters in file readdata (NMR module) to read in all restraints. By the final waterrefinement according to Linge et al. you have to change the parameter nrestraints.  To optimize the weighting between the potentials which represent the a priori knowledge of proteins and these potentials which use the informations from the with PERMOL+ generated restraints by structure calculation you must decrease the parameters md.hot.noe, md.hot.cdih, md.cool.noe, md.cool.cdih, md.cart.noe, md. cart.cdih, md.pow.noe and md.pow.cdih in script anneal.inp. In the waterrefinement script these parameters have to change with the parameter scale. The right choice of parameters can be detected by small energies - especially of the energies which represent the physical and chemical properties of proteins like that of binding length between atoms or Van-der-Waals energies of the generated structures, what means that the structures will be formes, but not deformed by the PERMOL+ restraints.  The time steps md.hot.ss, md.cool.ss, md.cart.ss and md.pow.ss must be smaller and - adapted to this - the number of iteration steps md.hot.step, md.cool.step, md.cart.step and md.pow.step have to increase. Elsewise it is possible that atoms „get lost“ by simulation, if the forces of these are too strong because of the big number of restraints, and then in one of the steps of iteration their new place could be out of the possible volume. The new version of PERMOL+ unifies ideas from: Andreas Möglich, Daniel Weinfurtner, Till Maurer, Wolfram Gronwald, Josef Scheiber, Konrad Brunner, Carolina Cano, Michael Ebel, Bärbel Kieninger and Hans Robert Kalbitzer. Authors of this new version are Bärbel Kieninger and Hans Robert Kalbitzer. If any questions arise contact baerbel.kieninger@ur.de. Kieninger, Bärbel (2015). ?Entwicklung von Methoden zur Strukturvorhersage von Proteinkomplexen und zur Untersuchung von Proteinzuständen mit Hochdruckkernspinresonanzspektroskopie.? Dissertation, Uni Regensburg. Möglich , Andreas, Weinfurtner , Daniel, Gronwald , Wolfram, Maurer , Till, Kalbitzer , Hans Robert (2005). "PERMOL: restraint-based protein homology modeling using DYANA or CNS." Bioinformatics 21 (9): 2110-2111. Mücke , Katrin, Paulus , Christina, Bernhardt , Katharina, Gerrer , Katrin, Schön , Kathrin, Fink , Alina, Sauer , Eva-Maria, Asbach-Nitzsche , Alexandra, Harvardt , Thomas, Kieninger , Bärbel, Kremer , Werner, Kalbitzer , Hans Robert, Nevels , Michael (2014). "Human Cytomegalovirus Major Immediate Early 1 Protein Targets Host Chromosomes by Docking to the Acic Pocket on the Nucleosom Surface". Journal of Virology 88 (2):1228. Cano , Carolina, Brunner , Konrad, Baskaran , Kumaran, Elsner , Ralph, Munte , Claudia Elisabeth, Kalbitzer , Hans Robert (2009). "Protein structure calculation with data imputation: the use of substitute restraints." J Biomol NMR 45 (4):397-411. Brünger , Axel T, Adams , Paul D, Clore , G Marius, DeLano , Warren L, Gros , Piet, Grosse-Kunstleve , Ralf W, Jiang , Jian-Sheng, Kuszewski , John, Nilges , Michael, Pannu , Navraj S, Read , Randy J, Rice , Luke M, Simonson , Thomas, Warren , Gregory L (1998). "Crystallography & NMR system: A new software suite for macromolecular structure determination." Acta Crystallogr D Biol Crystallogr 54 :905-921. Linge , Jens P, Williams , Mark A, Spronk , Christian AEM, Bonvin , Alexandre MJJ, Nilges , Michael (2003). "Refinement of Protein Structures in Explicit Solvent." Proteins 50 : 496-506. Downloading PERMOL+ is free of charge. This time limited software version is free of charge (100 days after installation, no additional license required).